AMIMON’s CONNEX, CONNEX mini, and CONNEX Fusion provide a high-end, high-performance wireless HD connection that can operate in challenging unmanned air or ground platforms under harsh conditions with zero latency, such as UAV/UGV. The small and lightweight CONNEX systems transmit commercial, industrial, inspection and monitoring video in real time to their Ground Unit(s), which can be located up to 1,000 meters away. 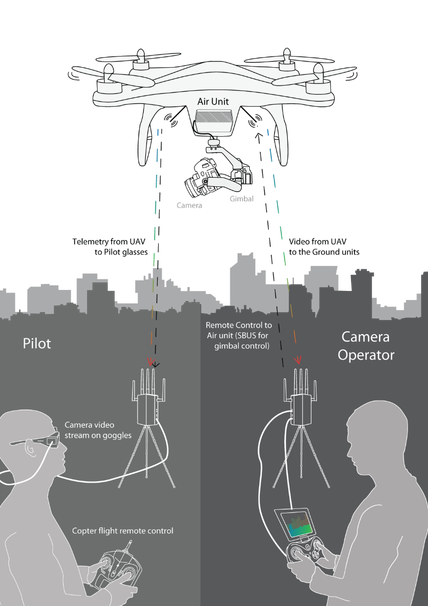 Air Unit: The Air Unit is connected to a drone in order to capture video from the drone's camera and to transmit it to up to four Ground Units simultaneously (multicast), thus creating a wireless video link. Ground Unit: The Ground Unit connects to various types of monitors, video goggles or a portable video monitor via the HDMI port. This enables the pilot and/or camera operator to monitor the video transmitted from the Air Unit. Pilot: The pilot can view the video on a monitor or wear video goggles connected to the Ground Unit. Flight control (telemetry) information from the drone is overlaid on the video. The pilot uses a remote flight controller to control the drone. Camera Operator: The camera operator can hold a portable video monitor on which the video can be viewed. The camera operator can use a gimbal remote control to control the drone camera’s gimbal through the S.BUS port of the Air Unit. Manual frequency selection option that enables setting a specific non-DSF frequency in the authorized regional spectrum.